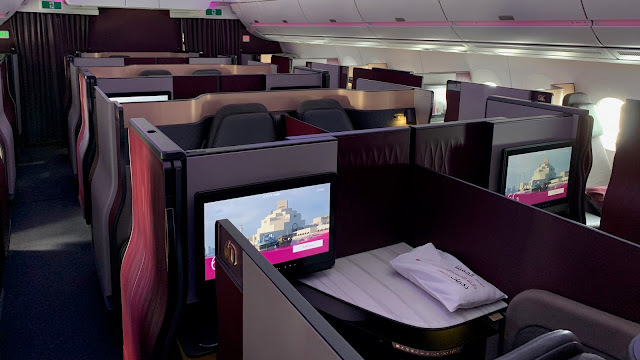 It´s time again to qualify for British Airways Gold status and with this first trip to Asia flying on Qatar Airways, I will get 560 tier points. This trip is an open jaw, flying from Oslo to Singapore and back from Hong Kong to Stockholm, booking flights on Scoot, Vietjet and Jetstar to fly us within Asia. With my second trip (to Singapore in August) and my third trip (to Bangkok in December granting Qatar Airways stays with OneWorld), I will get more than 1500 tier points which is more than enough to get OneWorld emerald status again. Also during this trip, we stayed at 8 different Hilton properties making my total stay to 19, and closer to the 30 stays needed to renew my Hilton Diamond status. Arriving with our SAS flight from Stockholm around 12pm, we headed directly to the OSL Lounge and spent our time in the Premium section as we waited for boarding. We left the lounge more than an hour before departure since we still had to go through passport control. Boarding began at 3:13pm and as usual, there was a special lane for business class passengers as well as those with status. 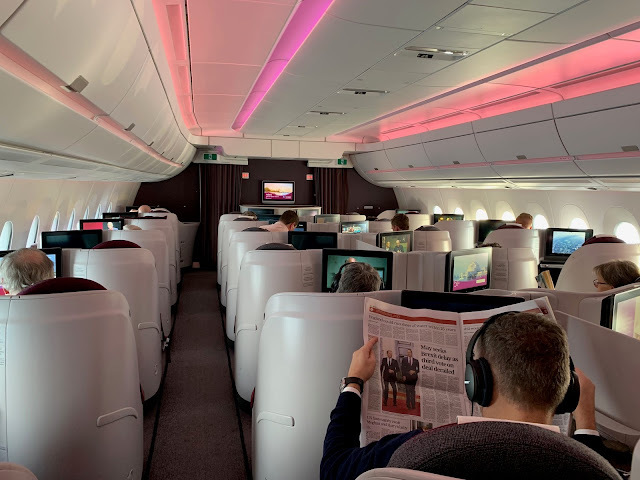 It has been 3 years since I´ve flown on an A350 which was from Frankfurt to Doha. It was only 2 months after the launch of the A350, with Qatar Airways being the first customer. Upon boarding, I was greeted by a flight attendant who directed me to my seat. I was then welcomed by the CSD, a very friendly guy from the Philippines. He also asked if he could hang my jacket although I declined. Waiting at my seat is a pillow and a blanket, as well as an amenity kit. The contents of the amenity kit were the same as the ones I got on my last flight with them last year which included a refreshing facial mist, an anti aging moisturizer and a lip balm from Castello Monte Vibiano but the pouch bag has been changed from Brics to Nappa Dori which are nice although I still prefer the ones from Brics 😉 Also, the same amenity kits were given on our connecting flight to Singapore which used to have Armani toiletries. 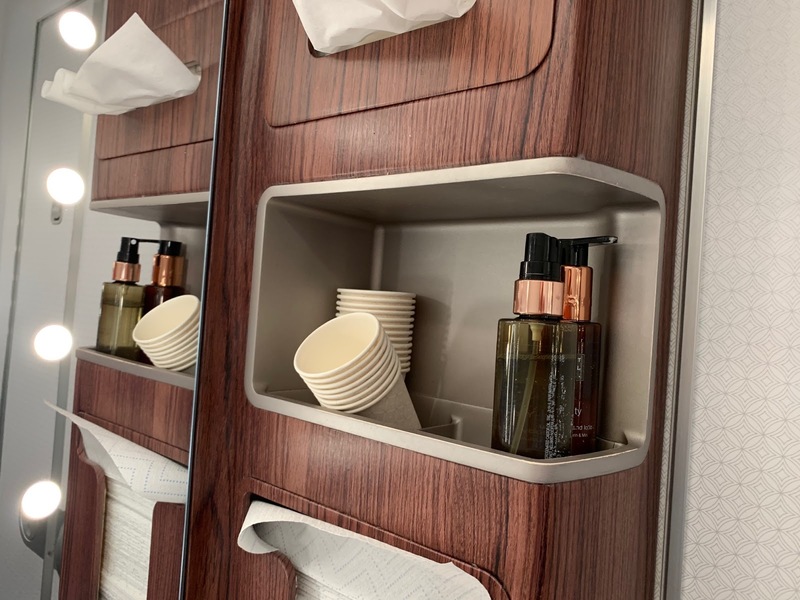 I guess Qatar Airways only have one amenity kit for Europe and Asia flights. There was also complimentary wifi with limit although I could not connect to it. Moments after settling in, we were offered some predeparture beverage as well as a choice of hot or cold towel. I on the other hand had a glass of apple juice. I commented about the new coaster design and was told that they have started using them just a few months ago. We were also offered some newspapers and was informed that we can find them at the back in case we would need them later. The menu card and wine list were also offered, informing us that they have "Dine on Demand". Around 3:48pm, the captain came on the PA to welcome us onboard and to give us some flight information including our flight time to Doha of 6 hours and 5 minutes. At 3:55pm, the inflight safety video was played on the screen and 2 minutes later, we began our pushback. Take off went smoothly and quietly at 4:10pm. To start the dinner service, I had an apple juice which was served with some mixed nuts. Then the table was set up, with butter, bread and the candle just like on Turkish Airlines flights. The amuse bouche followed which was salmon and tasted very good. Mike had the Cold Smoked salmon and which according to him was also very good. For my main course, I had the Lamb Loin with herb butter which was fantastic. The lamb portion was not that much though. For my dessert, I opted for some Fresh Berries with Orange Syrup. To end my dinner, I ordered a cup of green tea which was served with a small box of Godiva chocolates. 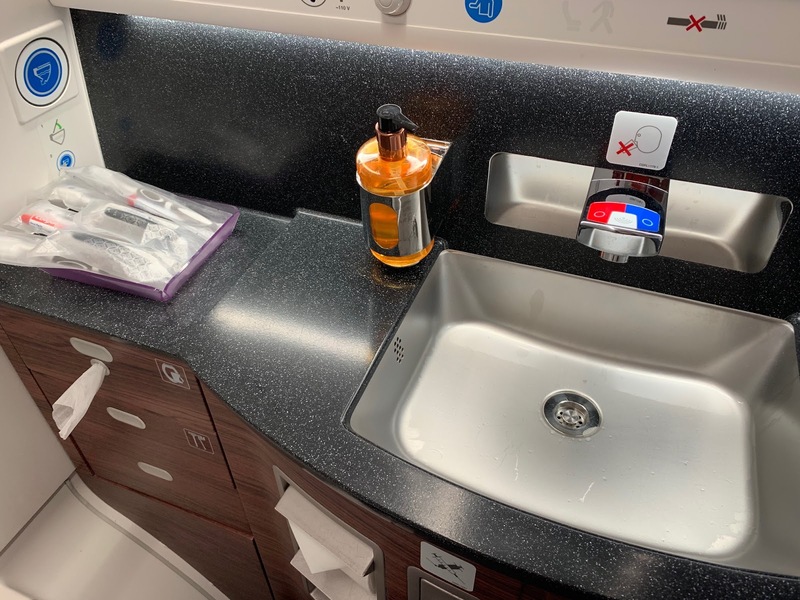 The onboard bar was set up just before starting dinner service and included a bottle of champagne, some fruits, snacks bar, etc. About 2 hours before landing, I had some fruits and a snack bar. Moments later, the flight attendants asked if we wanted to eat or drink something. I would have wanted to order from the "Light Options" menu so I could take pictures but I was not feeling hungry so I declined. 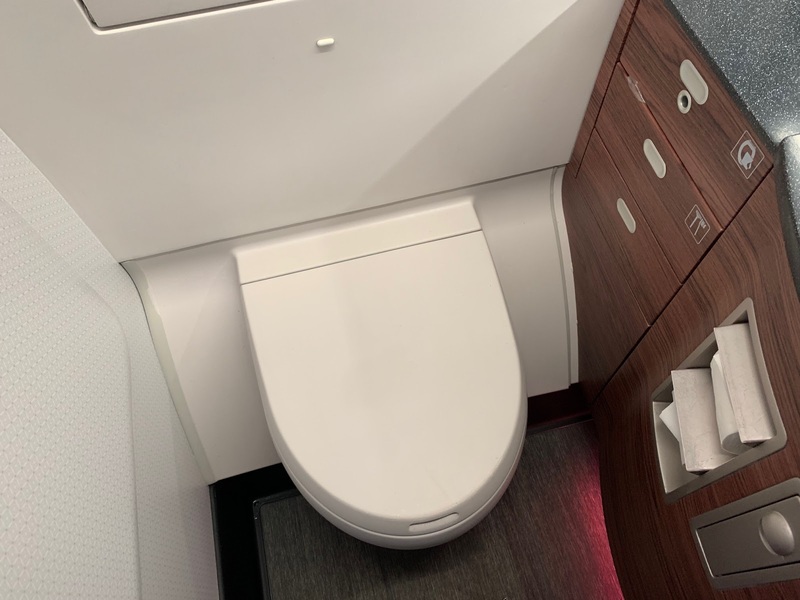 There are 3 lavatories on the aircraft, 2 in the back between the bigger and the smaller cabins, and one in front behind the cockpit. As usual, a perfume spray and a hand cream from Rituals were offered. 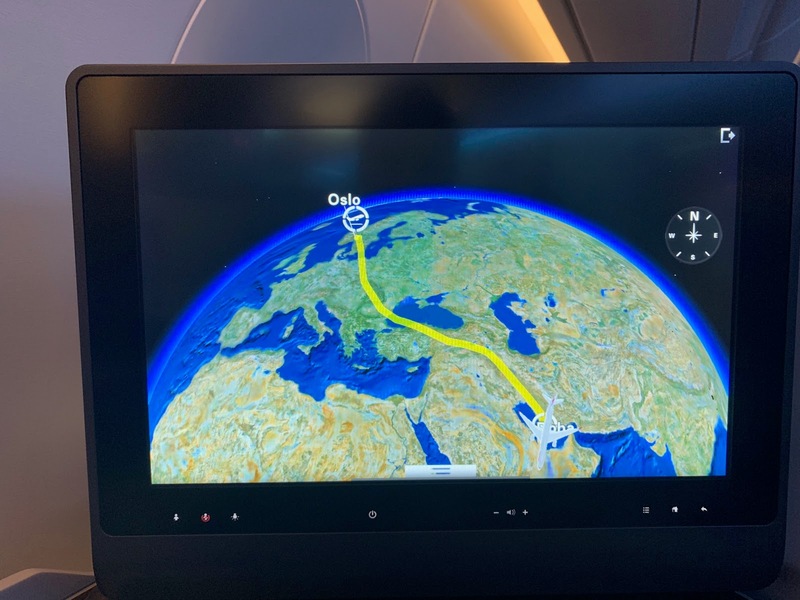 Around 11:25pm, the captain was back on the PA to give us updated flight information and that we would be landing at 12:10am, with a temperature of 20 degrees in Doha. The CSD came to thank each one of the passengers in the cabin for flying with Qatar Airways. We landed in Doha Airport at 12:18am and 4 minutes later, parked in a remote stand. 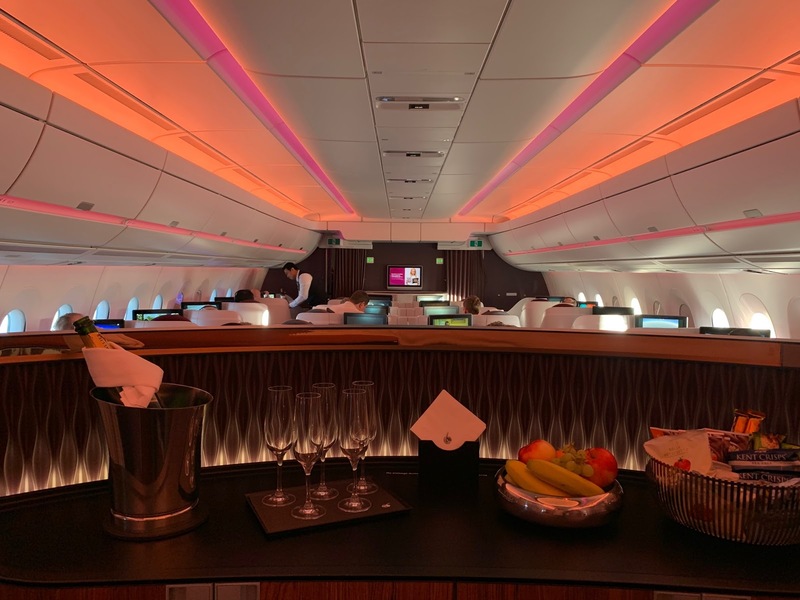 Fortunately, we had enough time to connect to our flight to Singapore, although it meant we couldn´t use the gorgeous Al Mourjan Lounge.